Gymnastics is known for many things: grace, acrobatics, skill, precision. But Sophina Saáde DeJesus broke with tradition and performed quite literally the blackest floor exercise in this history of ever. And she scored a 9.925 in the process. 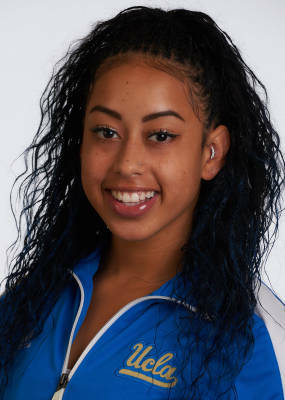 In between us coping with Beyonce’s game-changing video for “Formation” and the subsequent performance at the Super Bowl Halftime Show, this UCLA gymnast was completely shutting down her team’s competition again Utah. She had already scored 9.85 on both the bars and the balance beam, before she served the best floor exercise of modern times. Donning blue braids, her tumbling routines were flawless, completely sticking her landings. And in between passes. DeJesus was hitting the Quan, Whip, and Nae Nae, among others. Her team loved her, and the crowd was in shambles. And just to top things off, she ended with a Dab. Yes people, this is real. Something tells me this is just the beginning for this Sociology major. She already has a few major credits to her name, twice touring with Macy’s Passport and also appearing in both a Missy Elliott video and a Disney video. She has been on Ellen, Maury, and The Tom Joyner Morning Show as well as performing in a Broadway play with Debbie Allen.